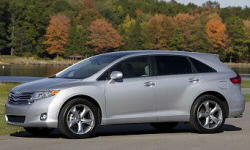 Toyota Venza Pros and Cons | Page 1 of 1 | Why Not This Car? What drives people to buy (or not buy) a certain car? TrueDelta's members share Toyota Venza pros and cons based on their real-world driving experiences. Best family car because of styling, interior room and ergonomics, performance (enough Horsepower for this size of the car), accessories, colors. This is the 4th consecutive Toyota or Lexus we have owned. Sought out for our extremely positive experience with regard to reliability. 08 Highlander SR5 gave us 4 yrs of problem free ownership --- Now going on 18 months with Venza of same. Powertrain is very strong. Nice feel and pick up on a 6 speed AT is very responsive, and reliable. Smooth shifting. Base 4-cylinder price was much higher than the mid-level Equinox LT. Distinctive, not boxy like an SUV or Wagon. Large wheels and sculpted sides make for a refreshing look. Kind of sharp. Belies the volume within.